Every year around this time, people begin making their plans for Valentine’s Day. There are restaurant reservations to be made for romantic dinners, heart-shaped boxes of chocolates to buy for your sweetie and children, and Valentine’s cards for kids to take to school. It’s fun, but it’s also up there with Halloween and Easter in terms of potential damage to your teeth and oral health. To help you have a successful and healthy Valentine’s Day, Bondi Dental offers some advice on how to be kissable AND to have a killer romantic date that isn’t affected by the threat of bad breath. Nothing makes a mouth more attractive and kissable on Valentine’s Day than beautiful, white teeth. The good news is that Bondi Dental can give you teeth that are eight shades brighter in only one visit! Our LED (in-chair) teeth whitening procedure is performed using a LED lamp light in teeth bleaching. The process takes about 1-2 hours depending on the degree of ‘whiteness’ that you want to achieve. You can walk out of our office with a brand-new smile! Another procedure that gives you a more kissable mouth is the scale and clean. A scale and clean removes tartar buildup on your teeth, cleaning deep down into gum pockets. Regular scale and cleans prevent the development of dental issues such as tooth decay and gum disease, gives you smooth teeth, and helps fight bad breath. While it may be tempting to quaff fine wine and enjoy a smoke, these might not be the wisest decisions if you want to keep your teeth bright white and clean. Avoiding tobacco and too much wine means your breath will smell better, and you’ll also avoid permanent stains on your teeth. Although Valentine’s Day is known for candies, fatty foods, and heavy sugars, a sweet tooth can sour your Valentine’s Day mouth. If you’re planning to indulge in chocolates, heart candies, and rich desserts remember that veggies, salads, and even the garnish on your plate are not only good for your body but can also counterbalance the acids found in snacks. Another good strategy is drinking water, washing away any unwanted bacterial visitors as well as any small bits of food that might remain in your mouth or between your teeth. If you’re going to receive and eat candy, cross your fingers that you’ll receive (or give!) chocolate. Solid chocolates (without chewy or sugary centres) don’t stick to the teeth like more chewy treats, making them better for your dental health. In fact, dark chocolate is an even better option, as it contains less sugar than milk chocolate! If you and your sweetie can’t stay away from candy, it’s best to enjoy it during your meal or just after it in order to keep from continually exposing your teeth to sugar and harmful bacteria. Also, be sure to drink water and practice a good, thorough hygiene routine afterwards! If you’re drinking super-sweet drinks, consider using a straw to protect your teeth and breath. Drink water for a kissable mouth. Not only does staying hydrated impart a healthy glow to the skin and plump up your lips, but it also keeps your mouth kissable. Drinking water helps to stimulate the production of oxygen-containing saliva which slows the growth of smelly oral bacteria. This Valentine’s Day, make water your beverage of choice and you and your loved ones will reap the benefits. Avoid food that causes bad breath. We usually say to eat your vegetables, but vegetables in the Allium family (chives, leeks, shallots, onions and garlic) аrе well-known fоr causing temporary bad brеаth. This comes from sulphur compounds that are good for health but bad for love”. Whеther or not уоu hаvе bruѕhеd your tееth the sulphur compounds ooze from your роrеѕ and mucous membranes. 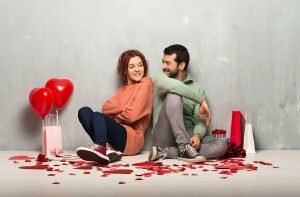 Avоid garlic аnd оniоn for a fеw dауѕ bеfоrе Vаlеntinе’ѕ tо аvоid this barrier to romance. There are two easy ways to protect your breath and your dental health. First, avoid “grazing”. Give your mouth a break to recover and break down the tiny food particles in your mouth. If you chew gum to freshen your breath, look for gum containing Xylitol, which helps your mouth maintain a proper pH balance. Bondi Dental is conveniently located in the Eastern Suburbs – Bondi Beach, Bondi in Sydney. Our exceptionally skilled dental professionals have more than 60 years of combined experiences in all fields of dentistry. We provide high quality dental preventative, restorative, and cosmetic services for all patients in the region. Bondi Dental has free parking behind our building and offers a FREE Dental Consultation including a complete dental check-up. We are open seven days a week 8 am – 8 pm! Call us on (02) 9365 7187 or visit us at 134 Curlewis St. in Bondi Beach.